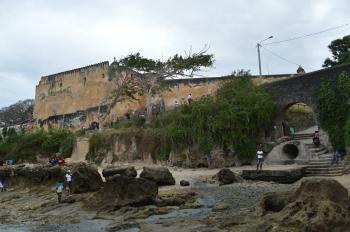 Fort Jesus, Mombasa is a Portuguese fort built in 1593. It was built in the shape of a man (viewed from the air), and was given the name of Jesus. 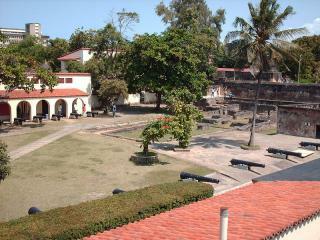 The fort was designed by an Italian architect, Jao Batisto Cairato, who was the Chief Architect for Portuguese possessions in the East. It was the first European-style fort constructed outside of Europe designed to resist cannon fire. Today, it is one of the finest examples of 16th century Portuguese military architecture, which has been influenced and changed by both the Omani Arabs and the British. In August 2016, I flew from Zanzibar to Mombasa, where I stayed at the Castle Royal Hotel, which dates from 1909 and is centrally located between the Moi Avenue tusks and Mombasa Old Town. Along with a guide from Diani Tours (http://www.dianisafaris-kenya.com), I walked from my hotel to the historic spice market (one of the most photogenic in East Africa) and then through the Old Town, where I visited the White House (which served as the first U.S. consulate in Kenya from 1915 - 1918), to Fort Jesus, a Portuguese fort built between 1593 and 1596. Based on what I had read, I thought it was prudent to arrange for a local guide, although the area seemed safe, at least for a daylight meandering -- still, it was helpful to have a guide to navigate through the labyrinthine streets from the spice market to Fort Jesus. ICOMOS recommended Deferral - proposal needed better justification of OUV, comparative analysis and buffer zone. Nigeria proposed inscription - passed nem con!